Patients with acute coronary syndrome are prone to hypoxia. Some of these cases are related to left ventricular failure while others are related to infection, but a rare cause, like pulmonary hemorrhage secondary to fibrinolytic therapy should not be forgotten. Major bleeding secondary to fibrinolytic therapy are reported in approximately 1% of cases. Pulmonary hemorrhage is fatal, frequently overlooked or discovered late. We describe a patient who received streptokinase for acute inferior ST elevation myocardial infarction (MI), which was complicated with pulmonary hemorrhage and ultimately died. A 75-year-old male presented to the emergency room complaining of left-sided ischemic chest pain for 5 hours. The pain increased during the hour prior to presentation and was associated with shortness of breath. There were no other symptoms. He has hypertension, diabetes, dyslipidemia and chronic renal impairment. Physical examination was unremarkable apart from a few bilateral basal rales. ECG in the emergency room showed ST elevation more than 1 mm in leads III and AVF and 3 mm ST depression in leads V2 - V6 and leads I and AVL. There was no evidence of right ventricular infarction. 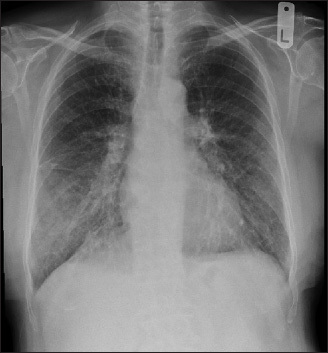 CXR showed normal mediastinum and right lower zone infiltrate [Figure 1]. Echocardiography showed ejection fraction (EF) 45% and severe hypokinesia of inferior wall and inferobasal segment. Serum troponin was initially normal but peaked to 181 ng/ml. White blood cell (WBC) was 36,200 cells/mcL (mainly neutrophils); hemoglobin was 12.3 g/dL; platelet count 402000/mmo; sodium was 131 mmol/L; and potassium was 5.0 mmol/L. Random blood sugar was 9.7 mmol/L; creatinine was 141 mmol/L; and urea 9.6 mmol/L; ALT was normal; low density lipoprotein 2.35 mmol/L; triglycerides 1.06 mmol/L; and high density lipoprotein 1.42 mmol/L. Streptokinase (1.5 million units) was started immediately according to standard protocol. He was commenced on aspirin 81 mg daily, clopidogrel 75 mg daily, simvastatin 40 mg nocturnal, carvedilol 6.25 mg BD, amlodipine 5 mg daily, and fosinopril 20 mg daily. After streptokinase, chest pain and shortness of breath resolved for the first 72 hours and there was significant improvement of the ECG (>50% resolution of ST elevation). However after 72 hours, he started to complain of dry cough and shortness of breath at rest, inspite of oxygen. He was given furosemide but without response. Hemoglobin dropped to 8.9 g/dL with no external bleeding, WBC decreased to 24000 g/L. ABG showed hypoxia (PO 2 = 7.8 kpa; CO 2 3.9 kpa; pH 7.32; O 2 89%; HCO 3 15.3 mmol/L). CXR showed increased bilateral basal reticular infiltrate and new right lower lobe opacity not seen on admission [Figure 2]. Repeated echocardiography was comparable to the previous examination. He was started on empirical antibiotic treatment, two units of packed red blood cells were given and HRCT was ordered to rule out interstitial lung disease or infection. A few hours later, SaO 2 started to drop again and urine output decreased to 20 mL/h, despite intravenous (IV) furosemide. Creatinine jumped to 438 mmol/L and ALT increased to 1383 IU/L. Urgent consultations from different specialties were requested. The patient underwent elective mechanical ventilation and urgent bronchoscopy. 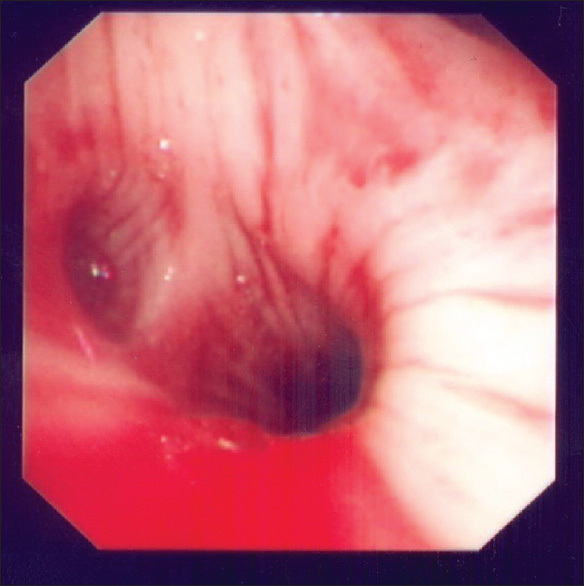 Bronchoscopy showed blood coming from the bronchial tree, mainly from left lower lobe with pale mucosa and no evidence of infection [Figure 3]. Bronchoalveolar lavage was performed and specimens were taken for hemosiderin-laden macrophages, cultures, and cytology. On the above basis, the respirology team confirmed the diagnosis of pulmonary hemorrhage. Aspirin, clopidogrel, and enoxaparin were stopped. Tranexamic acid 500 mg IV every 8 hours was started. On the 4 th hospital day, the patient reinfarcted as evidenced by elevation of troponin and CK MB, with new ST depression more than 2 mm in leads V2 - V4. Echocardiography showed further drop in EF to 30% with extension of infarction but no mechanical complications. Tranexamic acid was stopped. On the 5 th hospital day, the patient developed atrial fibrillation that required both synchronized cardioversion of 200 joules and amiodarone infusion. All cultures were negative. The patient went into cardiogenic shock and multiorgan failure on the 6th hospital day and passed away. Pulmonary hemorrhage is a potentially life-threatening complication of thrombolytic therapy. Reported cases of pulmonary hemorrhage are rare. ,,,,,, Pulmonary hemorrhage, although rare, needs to be considered in situations of pulmonary infiltrate with a drop in hemoglobin after thrombolytic therapy for acute MI with no obvious site of bleeding or where patients are not responding to oxygen or where other common causes like pulmonary edema or infection were excluded as seen in our case. Only a few case reports have been recorded in the Medline. The cases were all males aged from 50 to 66 years, and the majority received streptokinase for ST segment elevation MI. Out of 10 cases reported, all were males, 24-65 years old, six of them received streptokinase, while four received t-PA, and pulmonary hemorrhage occurred 12 h to 5 days after thrombolytic therapy. We think that further research is needed to explain the exact mechanism of this condition and careful patient observation after giving fibrinolytic therapy is required to diagnose this possibly fatal complication. We would like to thank Dr. Ayman B. Krayem, ABIM, FCCP and Dr. Sultan Qanash, Mb and ChB, for their help in managing the patient and providing the images. Cuéllar Obispo E, Torrado González E, Alvarez Bueno M, Ferriz Martín JA, Vera Almazán A, Rodríguez García JJ. A diffuse pulmonary hemorrhage following thrombolytic therapy in an acute myocardial infarct. Rev Esp Cardiol 1992;45:421-4. 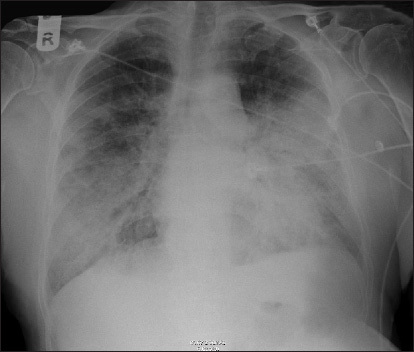 Rodríguez Blanco VM, Barriales Alvarez V, Morís de la Tassa C. Pulmonary hemorrhage after thrombolysis in acute myocardial infarct. An Med Interna 1997;14:209. Awadh N, Ronco JJ, Bernstein V, Gilks B, Wilcox P, Spontaneous pulmonary hemorrhage after thrombolytic therapy for acute myocardial infarction. Chest 1994;106:1622-4. Disler LJ, Rosendorff A. Pulmonary hemorrhage following intravenous streptokinase for acute myocardial infarction. Int J Cardiol 1990;29:387-90. Masip J, Vecilla F, Páez J. Diffuse pulmonary hemorrhage after fibrinolytic therapy for acute myocardial infarction. Int J Cardiol 1998;63:95-7. Swanson GA, Kaeley G, Geraci SA. Diffuse pulmonary hemorrhage after streptokinase administration for acute myocardial infarction. Pharmacotherapy 1997;17:390-4. Yigla M, Sprecher E, Azzam Z, Guralnik L, Kapeliovich M, Krivoy N. Diffuse alveolar hemorrhage infarction. Respiration 2000:445-8.